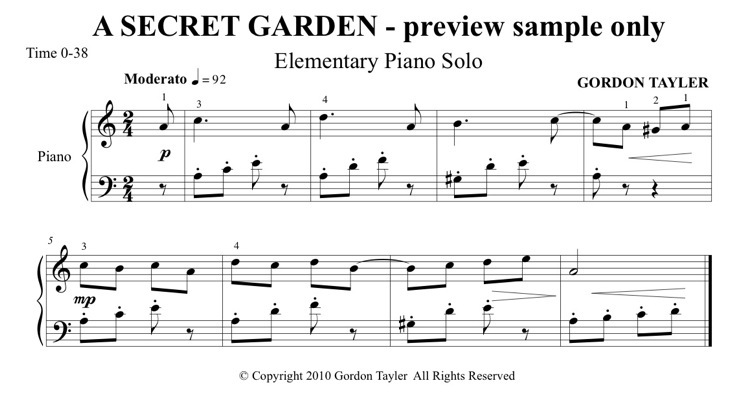 Play this beginner’s piece with a sense of mystery and quiet expectation. The LH should maintain a light and delicate staccatto whole arm lift action, always being careful not to overpower the singing RH, especially as the dynamics increase. Carefully follow the wide dynamic variations in the last 8 bars – bar 23 is a moment of surprise and wide-eyed wonder as we discover this hidden away treasure, but then much softer as we quietly absorb the beautiful secret garden.